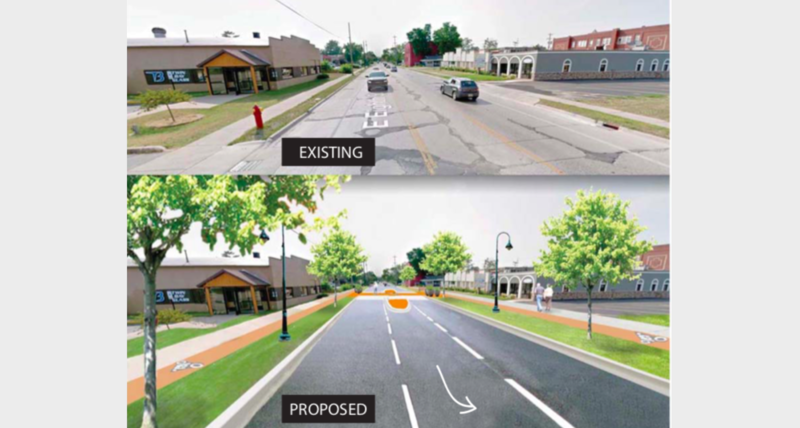 The City of Traverse City is closing in on its final design and engineering plans for Eighth Street – a project that will go out for bid in March before the complete reconstruction of the corridor between Boardman and Woodmere avenues begins this summer. Project consultant Gourdie-Fraser presented city commissioners with the latest look at the Eighth Street design plans at the commission’s Monday night study session. Key elements of the redesign that were supported by residents during a 2016 public charrette process – including a three-lane street configuration, greenspace buffers with trees and street lights, mobility improvements like cycling tracks and widened sidewalks, and underground utility upgrades – all remain intact. But some changes, most notably related to intersection reconfigurations, have been introduced throughout the design process. Consultants told commissioners that a traffic analysis of Eighth Street showed that there aren’t pedestrian volumes at the Wellington and Franklin intersections to justify traffic signals in those locations, which had previously been proposed. “Commercial development on Eighth Street would need to double in order to support a signal (in these locations),” the report found. Gourdie-Fraser instead is recommending installing underground infrastructure for “full, future signalization and installing a lower level of control to start, such as a pedestrian activated flashing beacon” similar to that used at the West Front Street and Elmwood Avenue intersection. A once-discussed reconfiguration of the Eighth Street/Railroad Avenue/Woodmere Avenue intersection was dropped early on in the design process due to that project’s cost and complexity, and plans to create raised intersections throughout the corridor were scaled back recently to shave $300,000 off the project tab, according to consultants. The cycle track is also now proposed to be directly next to the pedestrian sidewalk and of the same concrete material as the sidewalk, with no barriers or physical differentiation between the two other than paint color and signage. They are each planned to be five feet wide, or 10 feet total across – depending on easements obtained from property owners – and would be separated from cars by a green buffer containing trees and lights (design pictured). The cycle track is planned to merge into the roadway at intersections, but still positioned to put cyclists ahead of cars in order to cross the road safely and merge back onto the next section of track. Gourdie-Fraser is in the process of approaching property owners about closing extra driveways or curb cuts to businesses – up to 16 throughout the corridor – to reduce conflicts between cycle track users and vehicles turning into properties. The design also calls for mid-block crossings that feature a slightly raised refuge island in the middle of the road to help pedestrians cross Eighth Street. The island would be low enough that it can be plowed over by city workers and driven over by emergency vehicles. Commissioners expressed their desire to have consistent pedestrian signage and/or lights in place at both intersections and mid-block crossings and asked staff to consider streamlining design elements where necessary to reduce confusion. Gourdie-Fraser representatives noted the design was approximately 60 percent complete and said they will return to commissioners when it is close to 100 percent – likely within the next month – for final sign-off. Project estimates are currently at $3.7 million for the reconstruction, or approximately $400,000 over the initial $3.3 million baseline price tag. The initial estimate was projected to be closer to $4 million when engineering costs and contingencies were factored in. Representatives said the overrun was primarily due to too-low initial estimates for the underground utility costs, and not due to street amenities or design elements. Consultants said they were working with city staff to either lower costs or find additional funding sources to make up the difference. The reconstruction project is anticipated to break ground in July.